With an interesting design and great concept, is this stand an accessory you need to pick up? A sturdy body and unique design could make this a great nighttime companion. Some poorly considered design decisions limit the range and safety of tablets. While there are a lot of tablets this stand works with, it is incredibly important to know what you have and its dimentions before making a purchase. For my money, I would wait until the second version. There are certainly major positives and negatives in regards to this truly creative tablet stand. Let's start with the positives. The thick, fully adjustable legs means that it can be used just about anywhere with ease. Much of the marketing material shows it in use on a bed, with the owner watching a video or reading. That scenario is completely possible and seemingly safe. The legs can be used wide enough to ensure stability and are sturdy enough to withstand normal movement in bed. Now for the bad. The central piece of the holder, where the tablet sits, has 3 equally sized slashes in which to place the tablet. These fixed-width gaps guarantee that if your tablet is too large or too small, they will either not fit at all or will slide out. We tested a number of devices in the stand - some of which fit well, others were precarious at best. Then comes the strap and clip, intended to put pressure on the top of the tablet and hold it into place. Unfortunately, the strap tends to make some tablets fit worse than they do without it. For example, an HP TouchPad fits decently into the gaps with enough wiggle to make it unsafe, but as soon as you place the strap over the top, it pulls the tablet right out of the mount. The body and legs of this stand are incredibly well built and sturdy. Once the legs are put into place, they will not move accidentally. This is important because you are entrusting your expensive electronics' safety to the stand. You can be sure that the base is going to outlast any tablet you own. The only issue with the build is the plastic clip used to secure the top of the tablet into the getup. The front lip is a bit small and could break off if enough pressure is placed on it. Depending on the tablet in its trust, this could eject the tablet under those circumstances. The clip does seem thick enough to survive most usage. 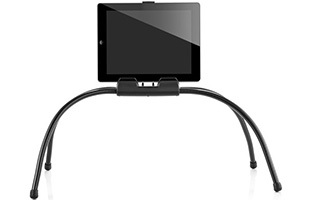 One of the main functions of a tablet stand is the safety of the device it holds. This tablet stand does not create the type of trust one would need to be able to use it with an expensive or essential piece of technology. Having watched it eject more than one tablet from its grip, sometimes quickly, sometimes hours later, I would personally never use this device as it is with any device I was proud of or needed to keep safe. With that said, however, I would consider its use in bed where a fall is protected with a device which I do not care as much about. In this case, using it with a Kindle Fire or an HP Stream 7 where its potential loss would not be a major financial loss, would be acceptable, at least to me. As an experiment, we made some adjustments to our review unit. Using another product we have in the office, we added four smaller versions of the legs as arms to cradle a tablet. This gave us a larger range of tablets that could be used with it, while also adding a much needed level of trust to the security of the device. This adjustment from the manufacturer could really turn this niche device into a stunner. The requirement for compatibility with this stand is that the tablet fit within the set-width 10mm slots. However, you don't want the tablet to be too thin, as this can cause the top latch to pull the tablet up and over the ledge of the slot. Also, if the tablet is too short, the strap may not put enough pressure on it, meaning it can slide around within the slot. With all of that said, a large majority of devices on the market today fall within the ideal width for this stand. Older devices, however, might not fit well, or at all. For example, the Surface Pro and Surface Pro 2, both popular with developers, will not fit at all.